Snook and reds should be good options during Nov.
As this is being written, the red tide outbreak in our area has improved significantly. Latest counts show very little to no red tide in Sarasota and Manatee Counties in the coastal gulf and inshore waters. You may find blues, Spanish mackerel and pompano mixed with trout on deep grass flats. You should also find larger trout in skinny water along with reds. 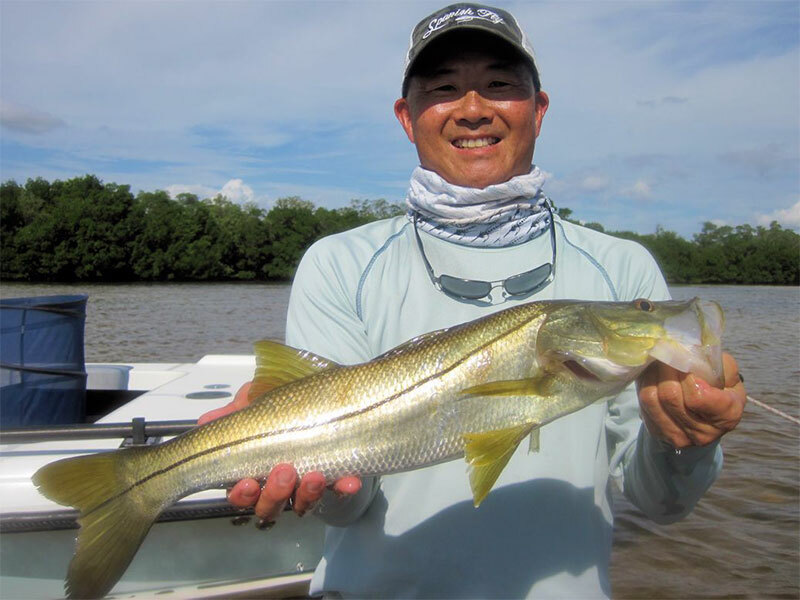 Snook will stage around bars and on shallow flats as they make their move towards winter areas. Action in the coastal gulf with false albacore, tripletail, Spanish mackerel, blues and more should explode! Remember that snook and reds are off limits on portions of the west coast now. The Florida FWC has enacted a temporary modification of regulations for reds and snook, in the areas affected by the recent red tide. The area extends from Pasco County, south to the south bank of Gordon Pass in Collier County. 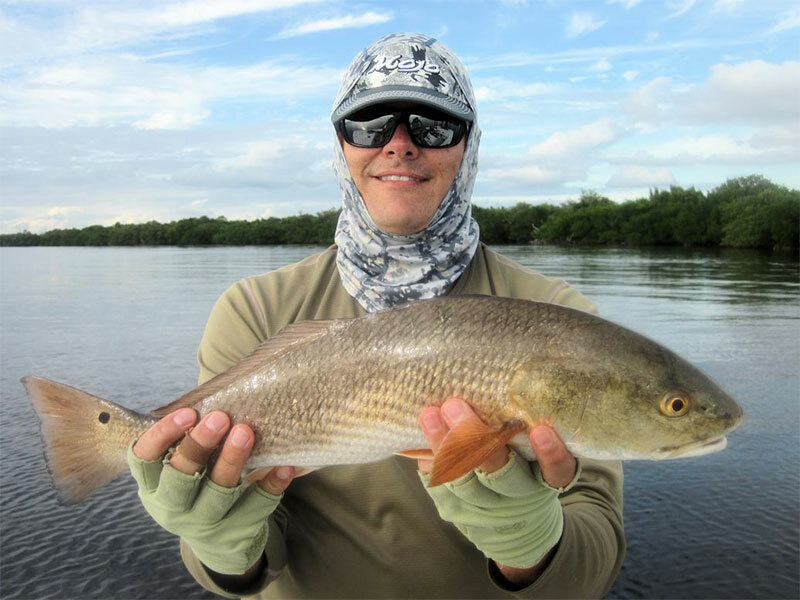 Reds and snook are catch and release only in that zone until May 10, 2019. I applaud them for taking this action to protect our fishery. Full details including exact boundaries can be found at www.myfwc.com/news/news-releases/2018/september/26/comm-red-tide/. Kyle Ruffing, from Sarasota, had good action with reds. You should find snook staging around docks and bridges in the ICW and along sand bars and in potholes on shallow flats. They may be along mangrove shorelines when the tide is high. I like CAL jigs with 3” and 4” shad tails, surface walking top water lures like the new DOA “PT” and DOA Baitbusters in shallow water for snook. CAL jigs with shad tails or jerk worms, DOA TerrorEyz, DOA Shrimp and small white flies, like my Grassett Snook Minnow, will work well around dock and bridge fender lights. Fish the strongest tides for the best action. I like the ICW between Sarasota and Venice at night for snook in November. Reds will spread out on shallow grass flats in November. You should find them along bars, in potholes or around docks. Look for them along mangrove shorelines when the tide is high, but they are just as likely to be roaming with mullet schools in shallow water. CAL jigs with shad tails, grubs or jerk worms, and gold spoons should work well for reds in shallow water. Fly anglers may score with lightly weighted flies, such as Clousers, spoon flies or my Grassett Flats Minnow fly. I catch a lot more reds wading than from the deck of my boat, so keep a low profile. Mike Perez with a tripletail he caught and released. You may also find big trout along with reds in shallow water this month. Although anglers may keep one trout over 20”, I release all trout over 20” since they are usually females that may be full of roe. The same lures and flies that you use for snook and reds in shallow water will also work for trout. You’ll also find trout on deep grass flats in water from 3’ to 7’ deep. I like to drift and cast quartering ahead of my drift with CAL jigs, DOA Deadly Combos or weighted flies on sink tip fly lines to locate trout. In addition to making a series of drifts to find fish, look for baitfish on the surface or birds to find them. 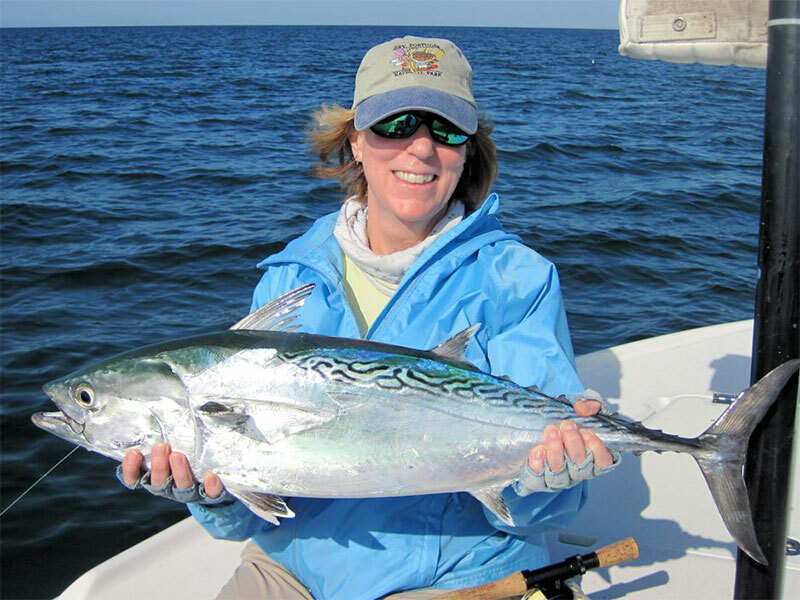 You may also find blues, Spanish mackerel, flounder or pompano on deep grass flats this month. The techniques to find them is the same as for trout, although blues and Spanish mackerel may feed on the surface making them easier to find. Likewise with pompano, that may skip on the surface when you run or drift past them. When that happens, circle back upwind and drift back through the area, casting ahead of your drift. I like a 1/16-ounce chartreuse CAL jig head with a gold grub for pompano. You’ll need to add wire or heavy fluorocarbon when toothy fish are around to keep them from biting you off. You may find flounder on a mixture of grass and sand, particularly on the edges of bars or in potholes. Nanette O'Hara, from Tampa, with a big false albacore. There should be good action in the coastal gulf with false albacore (little tunny), Spanish and king mackerel, blues, tripletail or cobia. Look for Spanish mackerel, blues or false albacore feeding on the surface to find them. Diving terns or terns hovering just above the surface of the water topwaterng fast will give their presence away if they aren’t on top. CAL jigs with shad tails and jerk worms and topwater plugs will work well. Fly anglers should score with small white flies, Ultra Hair Clousers, poppers or Crease flies. 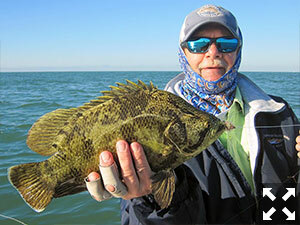 Look for tripletail around crab trap floats and cast DOA Shrimp, CAL jigs with shad tails or DOA TerrorEyz to them. Cobia may also be found around crab trap floats, swimming on the surface or over structure. They will require medium-heavy spinning tackle or at least a 9-weight fly rod. Larger baits like DOA Baitbusters, CAL jigs with 5½” jerk worms or the DOA Snake should work well for cobia on spinning tackle. Fly anglers should score with wide profile baitfish patterns. This a great month for fishing the flats or the coastal gulf. Since the action in the coastal gulf is seasonal and will end when it gets cooler, I like to fish there when conditions allow it. 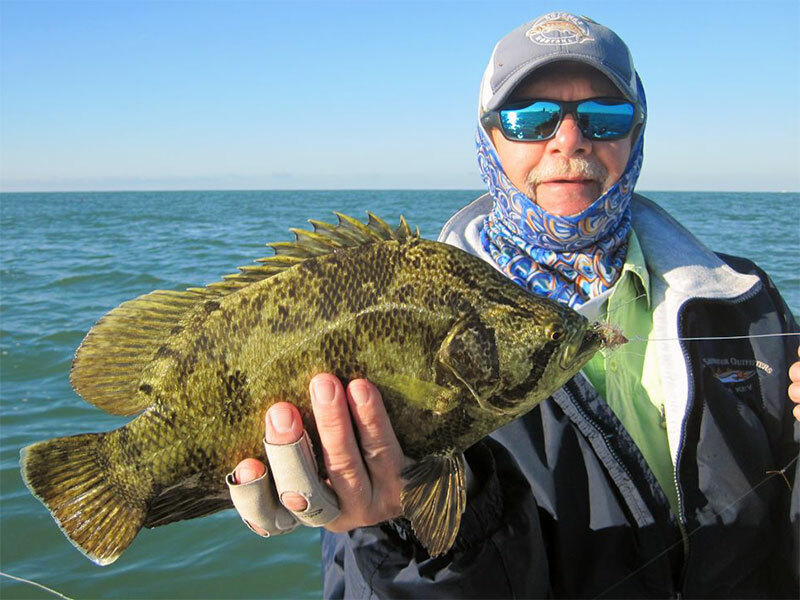 However, if that’s not for you or if conditions won’t allow it, there will be plenty of action for a variety of fish on shallow and deep grass flats of Sarasota Bay. Our natural resources are under constant pressure from red tides fueled by agricultural and residential runoff, freezes, increasing fishing pressure and habitat loss and degradation, please limit your kill, don’t kill your limit!